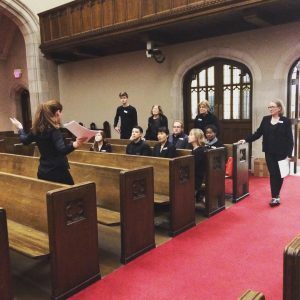 For over 120 years, the Toronto Mendelssohn Choir has been fortunate to engage a dedicated group of volunteers who usher at concerts, welcome participants to Singsation Saturday, assist in the office and help plan our special events. If you would like to volunteer this season, check out the volunteer opportunities below and complete our online TMC Volunteer Application Form. The TMC is looking for volunteer ushers for six concerts over the 2018/19 season. If you enjoy choral music and don’t mind a little work, we’d love to have you join our concert volunteers. Duties include greeting patrons, handing out programs, and ushering patrons to their seats in our church venues. After a busy hour, sit back and enjoy the concert free of charge! Reporting to Kathleen Stevenson, Manager of Artistic Operations, the TMC Backstage Assistant will help with coordinating and communicating with choristers and guest artists to ensure that concerts are run in a timely and smooth manner. The Backstage Assistant would also help coordinate timing with Front-of-House staff. Our Singsation Saturday workshops are planned and organized by a small group of TMC choristers. We would love some outside help – setting up chairs and refreshments, registering participants, and handing out music. Then stick around to sing great choral works in the 2 1/2 hour workshop with noted Toronto conductors.